Either stock could be a big winner, but right now, it's no contest. The Nasdaq Composite has had a downright awful seven-week stretch. Since peaking in late December, the collection of companies has seen its value drop by almost 16%. 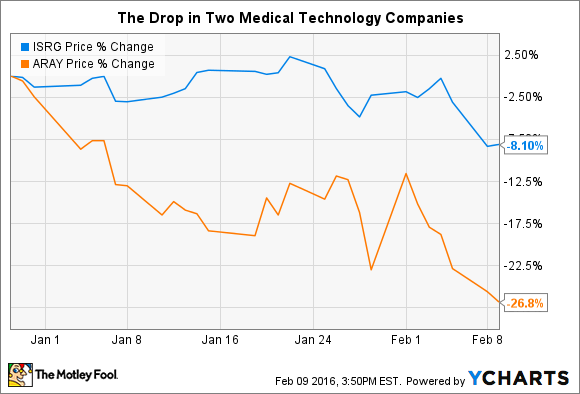 Two of the leading medical tech companies haven't been able to escape the swoon. Intuitive Surgical (NASDAQ:ISRG), maker of the daVinci robotic surgical system, and Accuray (NASDAQ:ARAY), creator of the Cyberknife that helps delivered more focused tumor treatment, are among the victims. If you were looking to gain exposure to this potentially lucrative industry, you might be enticed to go after Accuray, as shares have fallen at a much steeper pace recently. But that wouldn't be a very comprehensive way to make a stock-buying decision. Instead, let's evaluate these two companies on three different levels, and see which really is the better buy at today's prices. There are no two ways about it: when you have lots of debt on your balance sheet, or when you are bleeding cash by simply running your business, you are fragile to even the slightest disruptions. If, on the other hand, you have a large stash of cash -- or are producing enviable free cash flow -- then business swoons can represent an opportunity: You could use the cash to acquire other businesses, buy back your own stock, or even lower prices to force your competitors into bankruptcy. When we compare where Intuitve Surgical and Accuray are in terms of such financial fortitude, it's easy to see who is on top. Net income and free cash flow represent trailing 12 months. Source: Yahoo! Finance. With well over $1 billion in cash and equivalents on hand and no debt, Intuitive Surgical can weather a downturn in business. In fact, that's exactly what happened two years ago. A combination of the onset of the Affordable Care Act and a reduction in the number of benign hysterectomy operations using the daVinci caused shares to dive 40%. But the business itself was never in serious trouble: plenty of cash was on hand, and management had the opportunity to buy back stock at lower prices. Once the stock recovered, shareholders reaped the rewards. While Accuray isn't exactly in dire straits -- with free cash flow having turned positive -- it certainly doesn't have the same amount of flexibility that Intuitive does. The company has yet to turn a profit as a publicly traded entity. One of the most common sayings in investing is that the past is not an accurate indicator of the future. And while there's a mountain of evidence to support that statement, it's also true that companies showing enormous potential for growth often have revenue that has increased in kind. Here's how the two companies stack up over the past one- and three-year periods. Source: E*Trade. 3-Year growth is cumulative, not annualized. Intuitive and Accuray sit at about the same spot when it comes to three-year growth rates. The big difference is that if we zoom out even further, Intuitive has a long history of improving revenue steadily, with the only hiccup being the aforementioned problems encountered two years ago, while Accuray's growth tends to be more lumpy. That being said, this doesn't directly relate to potential. The narrative for Intuitive Surgical is quite simple: As more and more doctors experiment with the daVinci and its ecosystem, the robot could be used to improve patient outcomes evermore operations. Currently, hernia operations represent the most recent growth opportunity. In Accuray's case, the simple solution to the company's profitability problems is adoption by the medical community. Management has been doing all it can to convince doctors that the Cyberknife and TomoTherapy system can help target and treat tumors while causing less damage to other parts of the body than conventional treatments. In the end, I'm not a medical professional and have a difficult time discerning which opportunity is more real. I think the potential between these two is a wash. Instead, we'll look at each company's price-to-sales (P/S) and price-to-free-cash-flow (P/FCF) metrics. The important thing to understand here is that Accuray trades for a much lower P/S ratio because the company hasn't been able to convert any of those sales into profit. When we evaluate both of these companies by a much more meaningful metric -- P/FCF -- Intuitive Surgical is once again the easy winner. 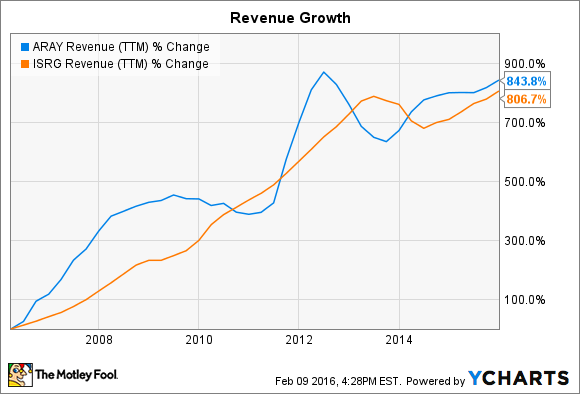 Five years from now, it may very well turn out that Accuray outperforms Intuitive Surgical. However, Intuitive is a much safer bet right now, as the company has a solid balance sheet and a history of providing solid streams of cash from operations. Accuray's future seems much less certain.